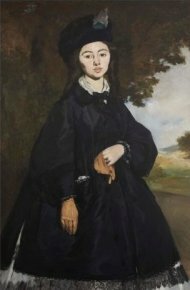 3/12/11 - Acquisition - Los Angeles, J. Paul Getty Museum - It is still possible to acquire a Manet as recently proven by the Getty Museum which announced its purchase of the Portrait of Madame Brunet or Young Woman of 1860 (ill.) from a private collector. The painting was in the famous Joan Whitney Payson collection for a while, along with Van Gogh’s Irises (1889), which has now been hanging at the Getty also for about twenty years. Representing probably the wife of Eugène Brunet, the sculptor, the work will be displayed as of December 13th at the museum where it will join The Rue Mosnier with Flags painted by the artist in 1878. Executed in 1860-1863, it evokes Manet’s first period, during which he did The Déjeuner sur l’Herbe. The young woman does not seem to be looking at the viewer, rather daydreaming or reflecting. A melancholy sweetness on her face, she seemed on the point of slipping on her glove before stopping. Her black dress announces the very beautiful portrait of Berthe Morisot with a Bouquet of Violets which the artist produced in 1872 ; but while the contours of Berthe’s face are drawn by a light coming from one side, Madame Brunet’s likeness is revealed in a harsher way by a uniform lighting, barely shaded by a small dark area on her right cheek. Manet chose a frank manner, clear contours and rather sharp lighting contrasts here, with no variations in the hues ; he placed his model in front of a landscape without really integrating the two. Manet seems to be alluding to compositions by Velázquez, for example the portrait of The Cardinal-Infante Ferdinand of Austria or that of Philip IV, presenting standing figures, in front of a landscape with a tree in the immediate background. We should point out that Manet cut out the bottom of this canvas in 1867, transforming it into a three-quarters portrait.